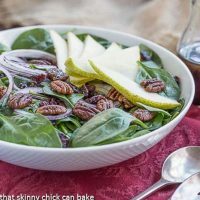 Spinach Salad with Pears, Cranberries and Candied Pecans are a refreshing and lovely autumnal salad that’s a perfect addition to your Thanksgiving table! The typical Thanksgiving table is loaded with carb heavy dishes. 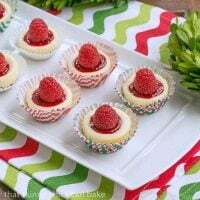 Mashed potatoes, stuffing, salads drenched in sweetened whipped cream, dinner rolls, pies and more! A simple green salad is the perfect healthier addition, especially one with fabulous fall flavors! I am joining up with a group of superb bloggers for a Thanksgiving Potluck. 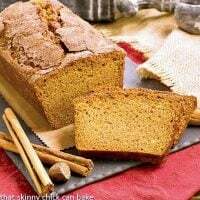 If your menu for the holiday is not complete, you will find excellent inspiration in the amazing array of Thanksgiving recipes here today. After a week of cookie recipes, I decided to veer off the baking path and make a healthier autumnal dish. This Spinach Salad with Pears, Cranberries and Candied Pecans is tossed with a simple, yet memorable, maple vinaigrette. A green salad is the perfect way to balance out the carb loading that is typical of our turkey day menu. This salad dressing with a touch of maple syrup is a new favorite…just incredible. Feel free to shake up the nuts. Use walnuts or hazelnuts if you prefer. Toss in some blue cheese if you want a heartier salad. You’ll love this one. Thanksgiving is also the time of year when we reflect on all our blessings. While many of us will have a week’s worth of Thanksgiving leftovers from a bounty of turkey, stuffing, mashed potatoes and gravy, not to mention the pies and desserts, many in America still go to bed hungry. Feeding America is a non-profit organization dedicated to providing food for our nation’s hungry through a network of food banks. They also focus on building a community of volunteers to help with this most worthy cause. Please visit their website if you’re interested in learning more about ways you can help feed America. If you’re looking for an end of the year charitable donation, please consider Feeding America. A tasty spinach salad with an autumnal flair! To make salad dressing, combine the vinegar, mustard, maple syrup, salt and pepper. Drizzle in olive oil while whisking constantly. Set aside. To candy the nuts, melt butter in saucepan. Toss in pecans and mix till coated. Add brown sugar and cook, stirring, till caramelized. Place on parchment to cool. To assemble salad, toss spinach, onions and pears with dressing (rewhisk as needed). 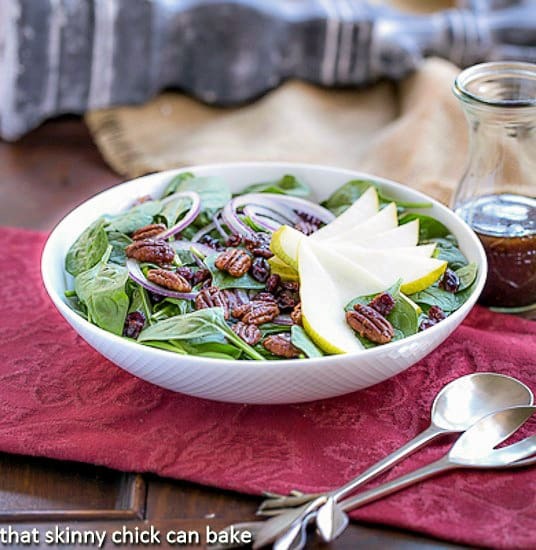 Top salad with cranberries and pecans. Inspired by The New Thanksgiving Table by Diane Morgan. You may soften your cranberries in a bit of salad dressing before adding to salad, if desired. 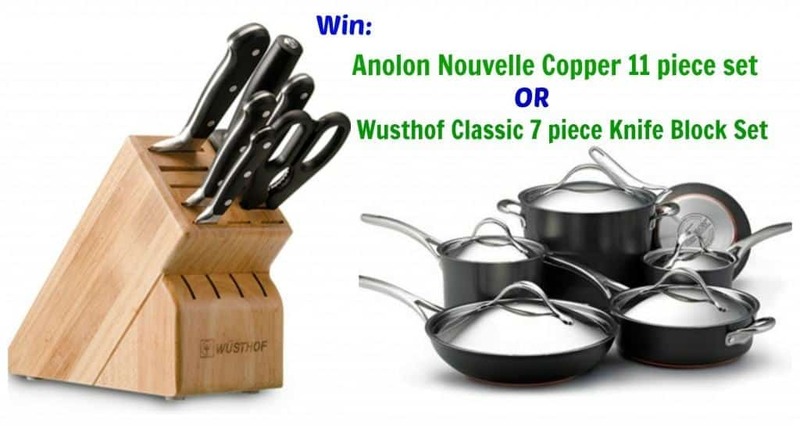 Special thanks to Wusthof and Analon for sponsoring this giveaway. 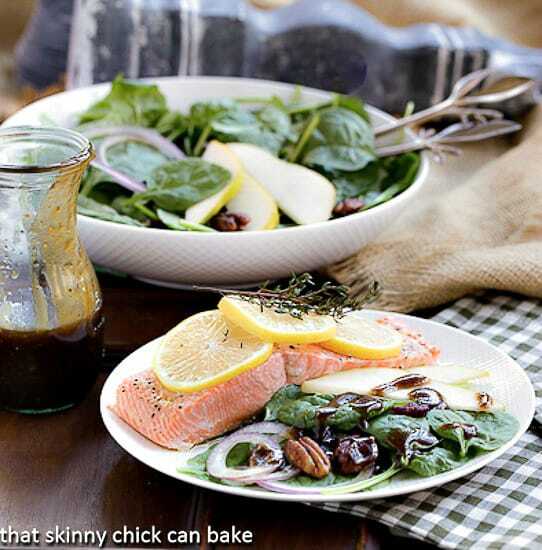 What a great salad Liz, would love this for Thanksgiving for lunch today! Thank you so much for joining us today! 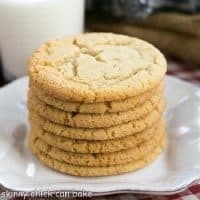 While I adore your baking, this post has my name written all over it! Love the maple syrup in the dressing too, so Canadian! A feast for the eyes as well. Nicely done. A variation of this salad is usually on our holiday table but I must try your maple dressing, it sounds wonderful! This looks way fancier than pot luck. I love this salad! 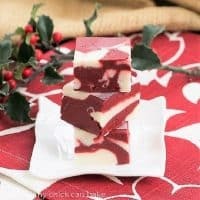 Pear and cranberry is one of my favorite combos! This would be a gorgeous addition to any Thanksgiving table (and goodness knows we always need a few more greens in my family.) 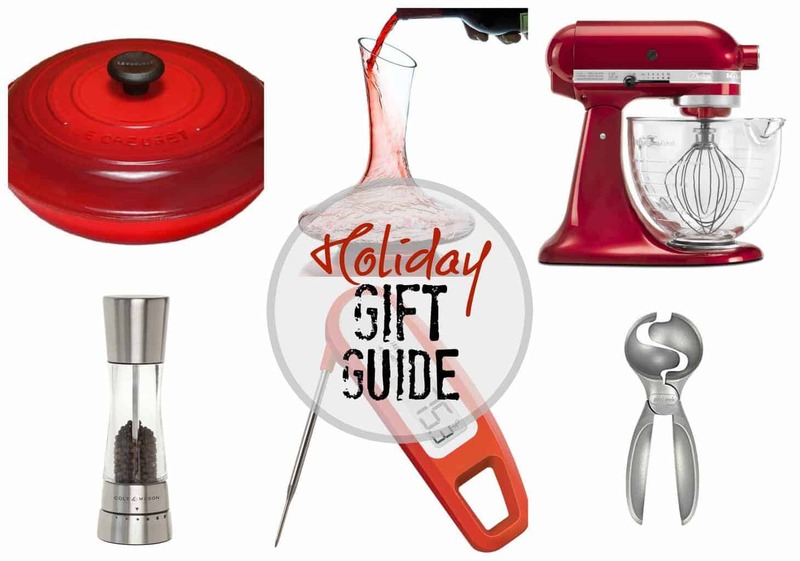 Thanks for the wonderful reminder to give back around the holidays too! I love a simple, elegant salad like this for fall parties! What a wonderful combination of flavors! Nice salad. It would be a hit here! What a lovely salad, Liz! I would definitely make this one! Thank you for sharing. This is such a perfect fall salad Liz! Wow – love the combination of pears, cranberries and these candied pecans! Simply fabulous! Gorgeous salad, Liz! I adore the combination of ingredients in the dressing, that’s a must-make for me. I love pears with salad and spinach is one of my favorite salad greens. I love spinach. Your salad looks delicious. I bet goat cheese would be great in that salad too. Maple syrup in the dressing sound yummy too. This salad is gorgeous! I love the idea of a maple vinaigrette. And thanks so much for educating us on this terrific cause. 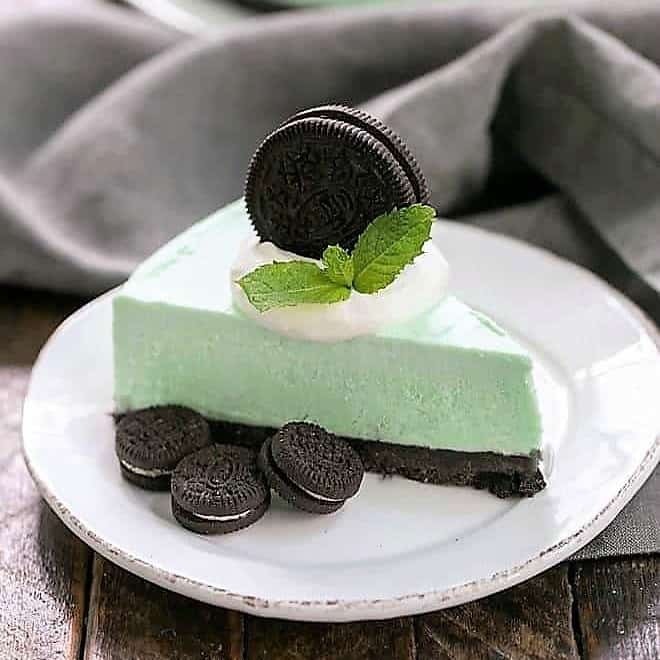 Liz, this looks so fresh and delicious. Love all your combination of flavors, textures and colors! I love salads like this and it’s perfect for fall. Pears, candied pecans and a vinaigrette with maple syrup – sounds luscious! I always get headache whenever there’s a potluck party. I’ve to admit it isn’t easy to come up with something that can be left on the table for a long time with the right temperate. Nice dish, Liz! Awesome giveaway! I reckoned those outside USA are not eligible? Can’t seem to find the rules…… Goodluck to all! 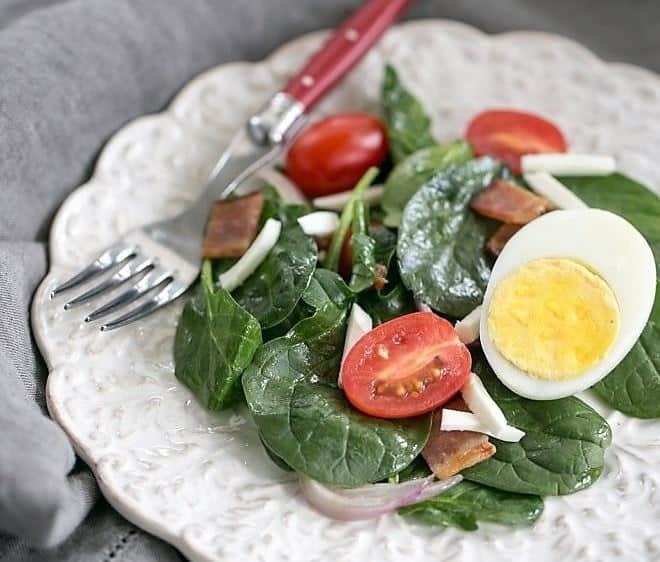 This spinach salad sounds delicious. I love the candied pecans on top! A very tasty seasonal salad, Liz. Perfect with salmon. Oh Boy does that look beautiful and tasty! Yum! What a wonderful salad to accompany the parade of dishes on a such important holiday!!! 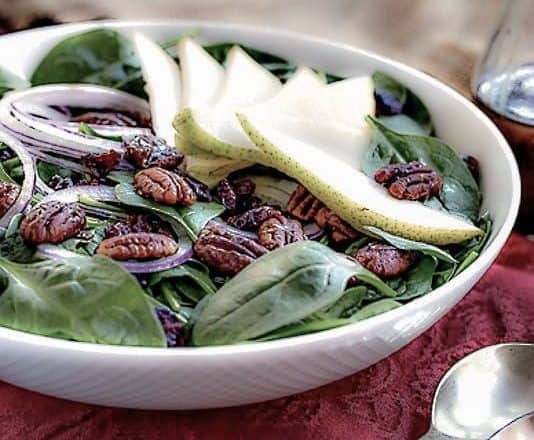 Adore spinach, pears and pecans. This is a fantastic and healthy salad for the holidays. Awesome salad to go with your salmon. What an amazing giveaway! I make a very similar salad but add goat cheese. Such a great one for Thanksgiving! This is a lovely holiday salad. The pears are a lovely addition. Liz this is one gorgeous salad. I love all the additions in it. Not only pretty, but so much flavour involved. So thrilled to work with you on this lady. You know I love any chance for us to do things together. Even if we don’t do Thanksgiving on our side of the pond, I have to do this, Liz. Love the combinations of flavours and textures. Dried cranberries with savoury? Brilliant idea.